DSLRUsers.com • View topic - Less weight - do you use camera straps around your shoulder? I am a wedding photographer. After a long day of shooting a wedding I am just so tired of having my cameras on straps around my neck. Do you use them? Which one would you recommend? 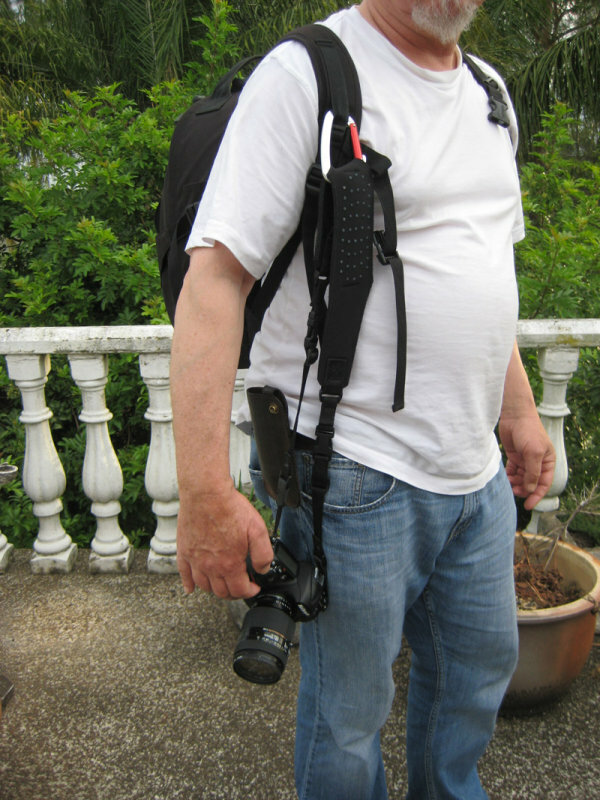 How about HoldFast camera straps? This method really takes the weight off as the whole backpack harness shares the weight. Snap a carabiner, (a real one), onto your pack and snap in the camera strap. Use an OP Tec strap as they can't be beaten for comfort...they give a little. Bowie knife is other side. I never travel without it. I use a UPstrap for years. I have never, had the strap slip of my shoulder.